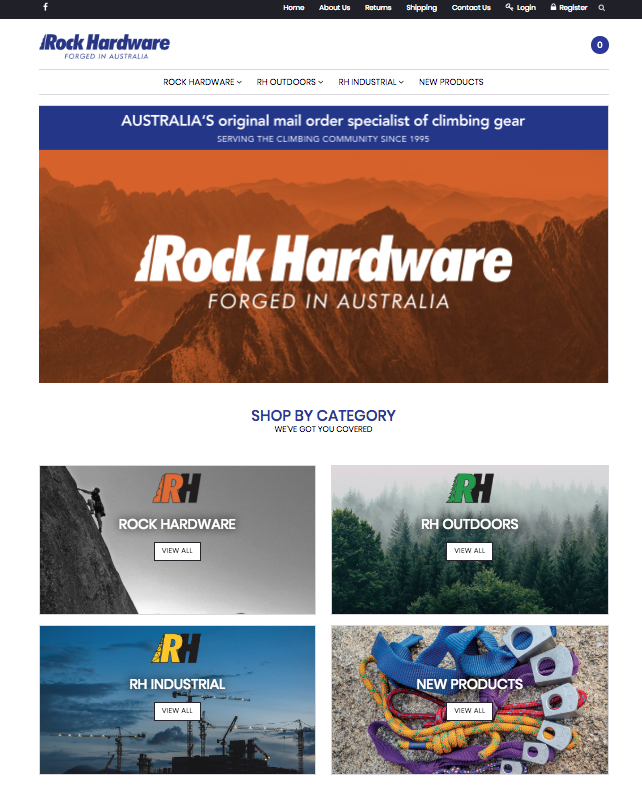 Updating the brand presence of Bendigo-based Rock Climbing specialty store. Mind Methods were tasked with creating a branding presence for Rock Hardware. We organised the inventory of the online store and delivered marketing collateral which included store signage. This exercise resulted in a clearly documented brand report, forming the platform upon which a refreshed brand identity was built and that will now influence how all future creative is approached (including photography, social media, website, video, advertising etc). ‘A desk with a view’: The Rock Hardware banner placed at the front of the store. Building on from the brand identity created for the company, we developed an aesthetic that captured the earthy tones of the adventure space. An emphasis was placed on the experience of the company within the climbing community. A message of “Service the climbing community since 1995” was decided on. We went with sunrise typography against the mountain to evoke being the light and peak of the climbing industry. We raised the level of polish on the existing brand by updating the outdoor signage to coincide with a new business card. In their online store we incorporated the brand identity presence across the website, and we also organised the inventory to be more user-friendly and easy to navigate. As a leading distributor of climbing equipment, we also emphasised the brand partners which Rock Hardware has been collaborating with for many years. We crafted the product page to be very informative whether they were enthusiasts or professional climbers. ‘Wish you were here’: Gold Foil Postcard as With Comps Slip. ‘Boarding Pass’: Business Cards for Gilton Valeo.